Insightful review as always Jacqui. I read this a few years ago. I agree that it is a solid book. Keun seems to be an underrated writer. I also agree regarding Sanna. She is very skillfully created character. As you say. She is not interested in politics. I sensed that she was aware of the growing evil around her however. Thanks, Brian. Yes, I agree. Even though Sanna would rather not think about or get involved with politics directly, she is savvy enough to appreciate that it cannot be ignored. She knows, for example, how close to the wind Gerti is sailing to the wind by continuing to see her man. I’m really glad to have discovered Keun – a much underappreciated writer indeed. Wonderful review, Jacqui. I’m very glad you liked this. This is one of the books I always keep for later, which is silly. And I saw the movie. I had to let time pass until that was sufficiently faded from my memory. She’s one of those examples that jsut show one could have seen it coming. From othe rreviews I remember that the naïve voice makes it particularly striking. Thanks, Caroline. 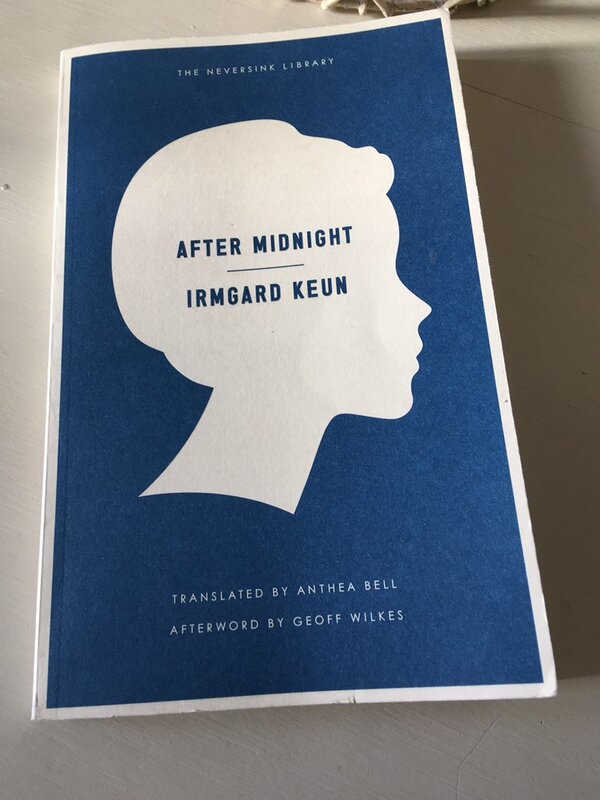 Keun has turned out to be a brilliant discovery for me, such a perceptive and clever writer – you really get a sense with this book that she could see the writing on the wall for her country. It’s a shame that it seems to be out of print in the UK (presumably that’s not the case in Germany). I had to hunt around a bit for a decent secondhand copy, but luckily I was able to find one in the end. Oh, and I didn’t realise there was a film version. Something to investigate…thanks for the tip. Not sure if it’s available with subtitles. She never went out of print in Germany. Recently ,all of her books have been republished in newer editions. She’s a tragic figure though. Oh, great. Thanks for that. I’ll have hunt around. Appetizing stuff — many thanks! You’ve reminded me that I ought to dig out the copy of The Artificial Silk Girl I got on the basis of your earlier review . . .
Oh, great! The Artificial Silk Girl is terrific. Doris has such a striking and engaging narrative voice, you’re sure to enjoy her musings on life in the big city. Great post. I have read two of her novels. Thanks, Mel. I’m glad to hear you have read her too. She’s turned out to be a real discovery for me. Great review Jacqui and I love that last quote. Keun was such an interesting figure and a wonderful writer. This was my first of her books, and I think it’s my favourite. A powerful read. Isn’t it brilliant? In a book jam-packed full of eminently quotable passages, that reflection of Heine’s really stands out. The whole thing just feels so vital and prescient, you can feel the sense of desperation mounting particularly towards the end. Thanks. Possibly one for next year, we’ll see. Lovely review, I remember your enthusiasm for The Artificial Silk Girl. This sounds wonderful too, Sanna sounds like a fascinating character. Another for my growing list. Thanks Ali. I can wholeheartedly recommend Keun to you as I think you’d really enjoy her books. There is something of Flammchen (from Vicki Baum’s Grand Hotel) about Doris, the narrator of The Artificial Silk Girl, and Sanna is in a similar kind of mould. Keun seems to have a very smart way with these seemingly naive narrators as they’re actually a lot sharper that one might assume at first sight. I loved After Midnight which I think I read a year ago. I’ve only got The Artificial Silk Girl to read, which you’ll be pleased to know is being published by Penguin Modern Classics next year. So I discovered yesterday when I was chatting to Naomi! How exciting to see it getting a new release. I’m pretty sure you’ll enjoy it. This sounds wonderful Jacqui, a very subtle and clever read. I remember your review of Keun before, I definitely need to read this author. If the library doesn’t have her I’ll put her on the to-buy list for when my book buying ban is over! Oh, yes – please do. She’s turned out to be one of my best discoveries in recent years. What impressed me most about this was the perceptiveness of Keun’s observations and the way in which they were presented in the book. There’s a lot more insight and depth to Sanna’s seemingly casual observations than one might think at first sight. Sadly, this one seems to be out of print in the UK right now, but the good news is that Penguin will be issuing a new edition of The Artificial Silk Girl next spring. Something to look forward to once you’re able to buy books again! Excellent review, Jacqui. I love books which have that veneer of simplicity with great and subtle depths beneath the surface, they make you think without being forceful and are the more powerful for it. I suspect this might Keun’s speciality, these seemingly naive and endearing narrators whose musings reveal hidden depths. As you say, they lend these books a subtlety and power without ever feeling too blunt or didactic. I think you might like this author’s work, especially given the connection with history and real events. And I agree, this Melville House edition is great. Alas, I think it is OOP. I just saw on my phone tonight that Anthea Bell has passed away at 82 years of age. She translated Stefan Zweig’s The Chess Story which I enjoyed so much for German Literature Month, as well as this book which you have reviewed. So sad to lose her skill. Yes, I saw the reports of her passing a few weeks ago. As you say, such a sad loss. I’ve read two or three of her translations of Zweig, plus others such as the Keun, and they’ve all felt very accomplished. Her name on the translation is a definite selling point for me.